Have your teeth lost their luster? Teeth discoloration is a common dental problem that annoys men and women alike. Before you think about whitening your teeth, you should understand why teeth get discolored or yellow in the first place. 1. Cigarettes – If you want a beautiful smile, you should avoid smoking. 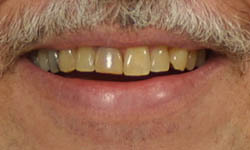 Cigarettes and cigars stain the teeth and make them look dull and unattractive. Chewing tobacco can also stain the teeth. Keep in mind that if you quit smoking and get your teeth whitened, you will feel better about yourself and your teeth will look fabulous. 2. Medicine – Some over-the-counter medicines and antibiotics can dull the teeth and make them look yellow. Some antihistamines also stain the teeth. If you take medication, tell your dentist or doctor about it and find out if it’s affecting the appearance of your teeth. 3. Genetics and aging – As people get older, their teeth lose their luster and they can become yellow in color. Some people also have a thicker enamel and naturally brighter teeth, so you can thank your mother and father for your smile. 4. Dark drinks – If you want to keep your teeth looking bright, you should avoid dark-colored beverages like coffee and sodas. Red wine, beer, and fruity drinks can also make the teeth yellow. If you must drink these beverages, you should rinse your mouth with water or mouthwash after you drink them. You can also protect your front teeth by sipping these beverages with a straw. 5. Food – Colorful foods can also cause the teeth to get yellow such as cherries, blueberries, soy sauce, and cranberries. After eating these foods, you should brush your teeth with a quality toothpaste. 6. Bad habits – If you don’t take care of your oral health, your teeth will appear yellow and dull. If you want a whiter smile, make sure you brush after meals, floss, and visit a dentist twice a year for professional dental cleanings. If you don’t follow these tips, plaque will build up on your teeth and your teeth will become discolored. Good oral hygiene habits will help you prevent stains and decrease your risk of tooth decay and other problems. 7. Dental restorations – Silver fillings and other metallic restorations can stain the teeth over time. If you’re concerned that your fillings will discolor your teeth, you should consult with an experienced dentist. Many people are not happy with their teeth. Their teeth may not look as good as they would like them too. They may look yellow, brown, or even gray, making them feel self-conscious when they are around people. If your teeth are discolored or stained, you should consult with a qualified dentist. Your dentist will develop a teeth whitening treatment plan that suits your needs.